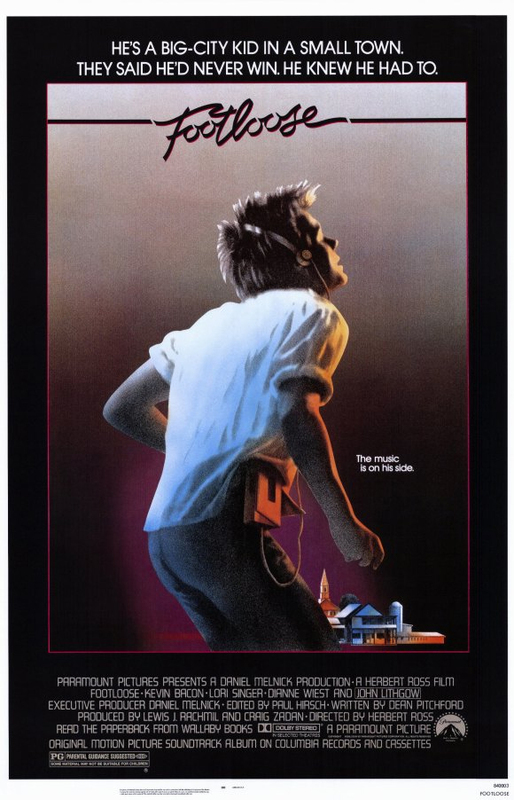 On this date thirty years ago, Footloose hit movie theaters across the country. There are several “movie musicals” that informed my upbringing and my eventual draw to the stage: Saturday Night Fever, Grease, Xanadu, West Side Story, Singin’ in the Rain, as well as others, and Footloose certainly ranks up there with the rest. It was a hit at many a school dance in the mid-80s and gave us a chance to show off, recreating the choreography straight from the movie. Connecting to last week’s Musical Monday post, I can’t say I’m all that fond of the stage version of this movie (they turned Ren’s speech at the town meeting into a lackluster rap. Yikes), and I have yet to see the remake, but the original will live on as a classic for my particular tastes. Happy 30th, Footloose! I remember, distinctly, buying caramel popcorn for this flick down in Calais, Maine, where the sound system is still able to replicate the sounds of adults in Charlie Brown cartoons with amazing accuracy through it’s single large speaker at the front of the theater. Ah, memories. This brings back memories of my mini cassette recorder, and a Kenny Loggins song on “Chris’s Mix Tape” …good times. How can you not love that damn song?